If you are looking for the perfect staircase, then look no further than Stromberg Architectural Products. Stromberg produces elegantly appointed staircases, made of the highest quality GFRC, for your home or business. Looking for a change of pace? You’ll appreciate Stromberg’s fresh approach to your design challenges as they work to create a custom designed staircase that’s in a class of its own. A very functional part of most buildings, a staircase can easily be taken for granted. However, the glass fiber reinforced concrete staircases Stromberg has designed for hospitality industries such as resorts, hotels and casinos emphasize quality with a distinctive flair. A GFRC staircase for a residential setting can be made according to your exact specifications or you may choose one from their large existing stock. Either way, you can trust the expertise Stromberg has developed over the past 30 years in the creation of GFRC staircases. Your staircase, whether indoor or out, will be seamlessly integrated into your existing décor and perfectly suited to your purpose. Stromberg is the top-ranking manufacturer of glass fiber reinforced concrete staircases and they are known for their superior craftsmanship. The professionals at Stromberg will take the time and effort to provide you with extensive support, from assistance with your design ideas all the way to installation. Find out for yourself how they out-perform the competition when it comes to your GFRC staircase. Stromberg GFRC is an engineered material. The glass fiber used to reinforce it has a higher tensile strength than steel, making GFRC a very durable material. GFRC will last as long as pre-cast concrete; this has been proven in accelerated aging tests in laboratories and in real life installations. 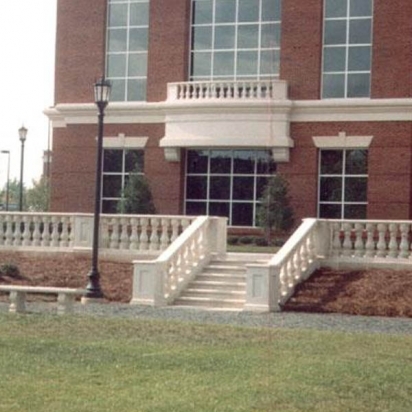 Glass fiber reinforced concrete from Stromberg won’t rust no matter what weather conditions it’s exposed to. It contains no steel reinforcement to cause corrosion, and its surface is Portland concrete, so it weathers like pre-cast concrete. GFRC can be cast into a wide variety of shapes and designs and you can choose from an array of different textures, colors and finishes. GFRC from Stromberg is a completely green material. Composed of minerals, cement, aggregates, glass fibers and in some cases mineral pigments and special polymers, its long lasting and earth friendly. Stromberg professionals respect the uniqueness of their clients and want to work closely with you to solve your design challenges. They offer you stock GFRC staircase designs as well as the option to create something completely original. Stromberg is here to help with CAD details and all design assistance and specifications. Contact them today at 903-454-0904 and put the best to work for you.